Slow Cooker/Crock Pot Beef Bourguignon is a fix it and forget it meal from an easy and elegant slow cooker recipe for winter. Slow cooker meals are a lot of things, but they certainly aren’t elegant. They might be delicious, of course they’re easy, they make your kitchen smell insane. and they make you feel all warm and fuzzy inside, but they aren’t what anyone would call fancy. And that’s ok. When you’re hungry after a long day you don’t need fancy. I’ve been thinking a lot about slow cookers lately. I’ve had one for years, but honestly it doesn’t get that much use. Most of my cooking is done from fresh ingredients in a pretty quick manner, and I don’t really need it on a regular basis. But every time I do haul it out, I fall in love all over again. And with both my daughters newly out on their own I’ve been reminded of what a godsend a slow cooker can be. Today I took my favorite Beef Bourguignon and adapted it for the crock pot and I must say, I think it’s a rare example of an elegant slow cooked meal. I say adapted, but I really didn’t have to do anything much, and it’s true that most soups and stews can be made in the crock pot, with just a few small adjustments. Some recipes fare better than others, though, and sometimes color and texture can be sacrificed in the name of convenience. I like to choose hearty dishes like stews and dried bean soups for my slow cooker; they not only tolerate, but benefit from the prolonged cooking time. my slow cooked peach barbecue smothered pork chops is a perfect example of how long slow cooling can take a normally tough cut of meat like pork chops, and render them literally fork tender. The secret to a great bourguignon is in the sauce. More specifically, it’s in the burgundy, its namesake deep red wine that tenderizes the meat and gives the sauce a rich base. A large shot of Cognac enriches it even further, and during the long slow cooking the two produce an amazing sauce. Browning the meat is an optional step, but if you have the time, I like to do it. Skip this step if you like. Heat the oil in large heavy saute pan or stock pot. Toss the meat with the salt, pepper, and flour, When the oil is nice and hot, brown the meat, in 2 batches, until browned on all sides, about 6 minutes per batch. 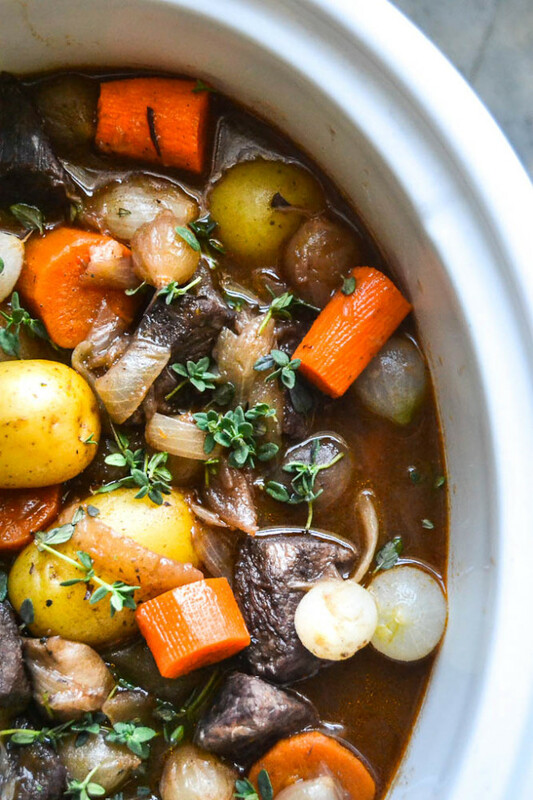 Put the meat in the bottom of your slow cooker and top with the bundle of thyme. Turn off the heat and add the cognac to the pan, and scrape up all the brown bits as the liquid bubbles. Add the wine and beef stock and continue stirring until you've gotten all of the good stuff off the bottom and sides of the pan, put it back on the heat if necessary. Stir in the tomato paste. Add the garlic, carrots, onion, potatoes, mushrooms and pearl onions to the slow cooker. Add the liquid from the pan to the slow cooker and give everything a gentle stir to get it settled. At the end of cooking, remove the bundle of thyme and taste to check the seasonings. I like to add a splash of vinegar at this point, add it according to taste. If you want a thicker sauce, stir in a knob of butter coated with flour, or sprinkle in some Wondra flour and stir well. Use corn or potato starch for gluten free. 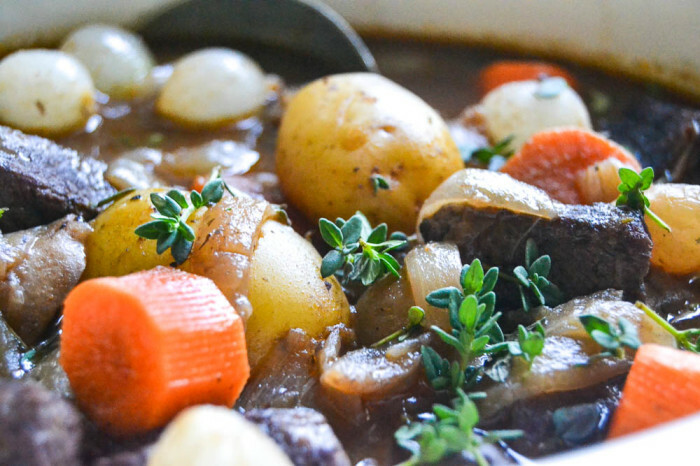 Serve the stew with a sprinkling of fresh thyme leaves. There is a lot of alcohol in this dish, and while most of is DOES cook out, even in a covered slow cooker, there will be some remaining...so save this for the adults. The potatoes are not normally included in Bourguignon, but I added them to round out the stew as a complete meal. No use in using the slow cooker if you have to make a side dish!